Super Easy Crispy Chicken is not only easy but only requires a few ingredients. Besides chicken, all that is needed is Catalina or Russian salad dressing, chili powder, crushed cornflakes and melted butter. That’s it! The first time I made this recipe, we were in the process of remodeling our kitchen. The only ingredients in the house were the ones needed to make this recipe. Guess what we had for dinner that night! You’re probably wondering how this rather odd cast of characters will turn out, right? Well that’s what I thought when I first read the list of ingredients. I assembled my ingredients, followed the recipe and crossed my fingers. It turned out fantastic. It’s still one of my hubby’s favorite chicken recipes. I found this recipe in one of my many Taste of Home recipe books, some 20 years ago. I’m not sure what happens when this chicken bakes, but the corn flakes become crispy while the salad dressing gets sticky and sweet. 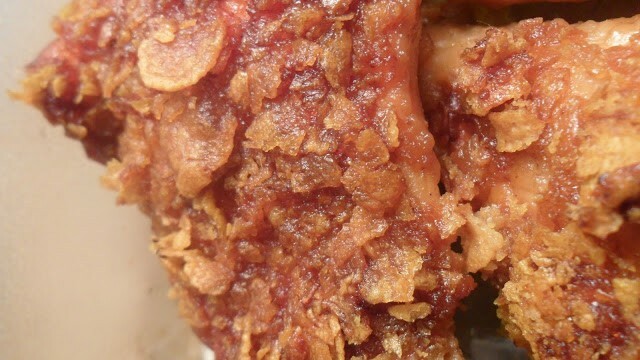 The two mixed together, results in chicken that is juicy, tender, crispy and slightly sweet. The chili powder added to the salad dressing is subtle enough that you can still taste it but say to yourself, “Hmm, what is that?” If your wondering what to make for dinner tonight, look no further. Give this recipe a try. Do you like mushrooms? So do we…so give these delicious recipes a try. Slow Cooker Ranch Mushrooms, and Bacon Stuffed Mushrooms to name just a few. We have many recipes that contain mushrooms, check out our Recipe Box! Super Easy Crispy Chicken would be wonderful served with a side of slow cooker ranch mushrooms and Easy Cheesy Risotto. *This recipe is dedicated to Ray. He absolutely loved this recipe and I made it for him often. Every time I make this recipe, I think of him. Only 5 ingredients are needed to make this super, delicious chicken. In large glass bowl combine; salad dressing and chili powder. 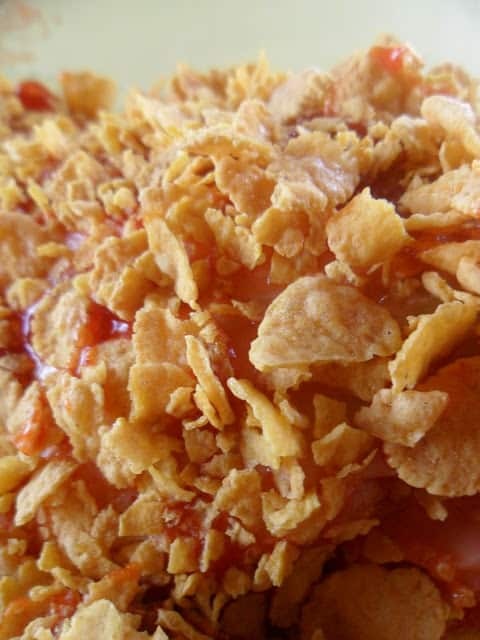 In 11 x 7 glass baking dish place crushed cornflakes. Dip chicken pieces in salad dressing mixture, then dredge in crushed cornflakes. Place coated chicken pieces in 13 x 9 baking dish. Bake at 375 for 1 hour and 15 minutes or until chicken is done.